With summer slowly coming to an end I think it’s time for a little EVS update. I’ve managed to get myself a busy but balanced schedule knowing where I need to go, when and what’s expected of me. I’m enjoying the pace of activities, language learning and my free time! I’m desperate to reveal all the highlights from the last month of my EVS. The first experience was another project based in Örkelljunga (the small little town I’m living in). “Your Voice Matters” was it’s name and it focussed on politics and youth participation. My main role was to an “external evaluator” and come in beginning to go through the rules and all the logistical parts of the project and then facilitate the evaluation. I also was given the opportunity to continue working on a project that I was part of before I started my EVS and was a university intern. I was so happy that this was possible as it is a great project about empowering women. And we’ve really made connections within the other staff, volunteers and women coming from the other countries. I was able to join the second mobility meeting in Poland where women experienced a floristry course, professional photoshoot and makeup session. As “staff” I was invited to take part in an Accessibility Training and for me it was the best part and most rewarding part. I learnt so much from the guest speaker the Polish organisation had welcomed to lead the session. She herself was blind but was full of confidence and life! She explained why she had lost her sight and how she was now going about her daily life despite the obvious barriers and obstacles. I loved her proudness and the way she openly explained everything so clearly and openly. 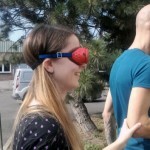 I experienced what it was like to blind for just a short time, by wearing these glasses with black lenses. I feel strange when I don’t wear my own glasses so when I put these other glasses on to simulate blindness I was completely out of my comfort zone. I was lead by another staff member within the training and he was helping to guide me. He would funnily lead me to certain objects or ask me to touch certain things and in most cases I couldn’t work out what it was or where I was. The session definitely raised my awareness and desire to learn more about people who are blind or partially sighted. My first few weeks here in Sweden have been full of learning experiences and new possibilities from an EVS arrival training to a youth exchange in the nature. This has been a highlight so far… “Back to the Nature”. 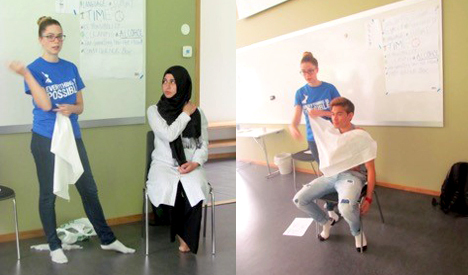 It was a one week youth exchange of non-formal and creative methods within the Swedish nature. It is honestly one of my favourite projects I’ve volunteer in where I was able to take a leadership role surrounded by positive and active young people. In this project I was given the opportunity to lead a Basic First Aid workshop, you never know what can happen to you outside in the wilderness! Supporting young people with some basic first aid skills could make all the difference. I also facilitated a few other presentations and supported in workshops. I really learnt a lot about my own leadership style and motivation and I now have even confidence and knowledge to lead different activities in the future. So, that’s my EVS update. It’s been full of learning experiences so far, new and old friends and plenty of opportunities to develop and learn as a youth worker. I might have got a degree in youth work but I feel now is when the learning really begins! For the full update please clink the link to my blog.